The walkers pause for a break on the edge of Stanton Moor. 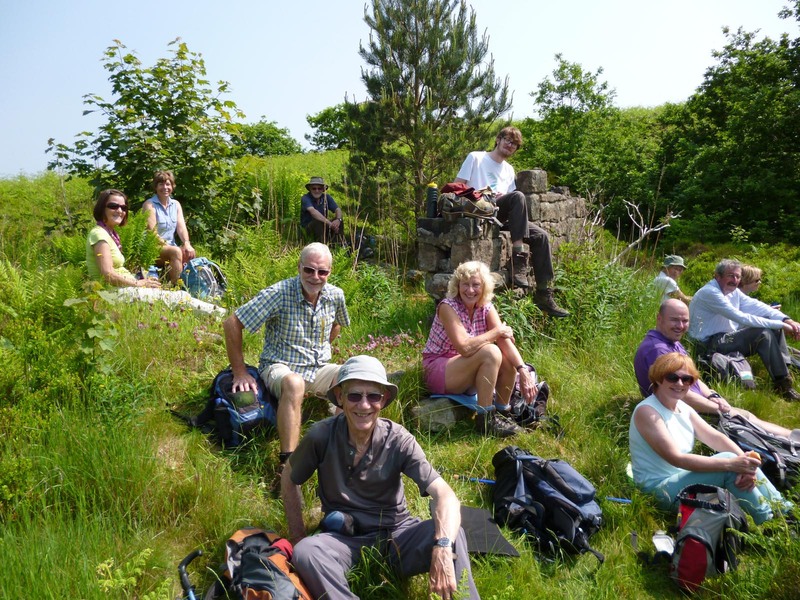 Tales of witchcraft and mystic ceremonies surrounded a recent 8½-mile walk by 13 East Cheshire Ramblers recently led by David Hough which started from Winster, Derbyshire, and ascended to Stanton Moor between Matlock and Bakewell. Among an astonishing array of prehistoric and other stone structures, the moor contains four Bronze Age circles of which the best known is Nine Ladies. According to Derbyshire legend, the ring of upright rocks (or menhirs) occupies the spot where nine maidens danced on the Sabbath and as a punishment were turned into stone along with the fidler who stands nearby. Apart from walkers and wildlife enthusiasts, the site is believed to attract followers of the occult and witchcraft for pagan ceremonies and rituals. 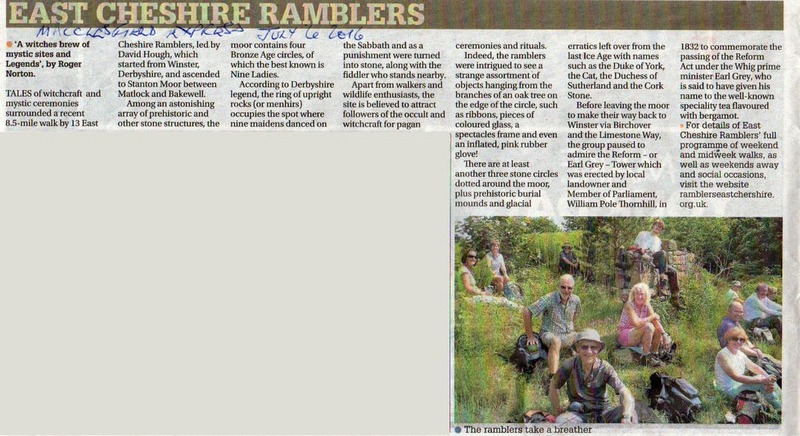 Indeed, the ramblers were intrigued to see a strange assortment of objects hanging from the branches of an oak tree on the edge of the circle, such as ribbons, pieces of coloured glass, a spectacles frame and even an inflated pink rubber glove ! There are at least another three stone circles dotted around the moor plus prehistoric burial mounds and glacial erratics left over from the last Ice Age with names such as the Duke of York, the Cat, the Duchess of Sutherland and the Cork Stone. Before leaving the moor to make their way back to Winster via Birchover and the Limestone Way, the group paused to admire the Reform – or Earl Grey – Tower which was erected by local landowner and Member of Parliament William Pole Thornhill in 1832 to commemorate the passing of the Reform Act under the Whig prime minister Earl Grey, who is said to have given his name to the well-known speciality tea flavoured with bergamot. This entry was posted in News, Walk Reports by admin. Bookmark the permalink.